These recordings are from Elaine A. Small's second album since returning to the music scene after a five decade absence. The tunes are mostly standards from the Great American Songbook supported by some of Canada's best award winning jazz musicians. TORONTO –From her start in the health care field as an X-ray technician, and cancer therapist, Elaine A. Small followed her dream to become a professional singer, and was soon a bona fide musical star singing with the likes of the Ramsey Lewis Trio, USA, the Johnny Gallant trio in Montreal, the Jimmy King trio in Winnipeg including the legendary Lennie Breau, and, along the way, sharing a stage with Oscar winning actor-singer Harry Belafonte, actress Mitzi Gaynor, film "South Pacific”, and Gordon Pinsent from "The Rowdyman", among others. As Elaine Steele, she was featured on many Canadian television and radio variety shows, also appearing at the Royal York and King Edward Hotel supper clubs in Toronto, the Ritz-Carlton Café in Montreal as well as the major supper clubs of the day in hotels across Canada and the Northern USA. As her musical career and family demands clashed, Elaine re-invented herself by entering the heady world of high-fashion, soon becoming a sought-after European fashion buyer for Toronto’s major fashion stores, including Holt Renfrew. As travel demands again created family problems she morphed into a successful Toronto real estate entrepreneur with a portfolio of investment apartment properties before once again switching careers, this time, to the hospitality business, including a motel/restaurant and historic B&B outside of Toronto. Each “life reset” was precipitated by a personal crisis or change in location. None defeated her. Along the way, she returned to York University to finish her interrupted degree and earned a BA Hons., concluded by a Master’s degree in English, following up on a lifelong interest in writing. The result was Priests in the Attic, 2010, her award winning first book. It describes her childhood as a “preacher’s kid” and her later multi-faceted life choices from her medical career, to her Toronto musical and broadcasting years followed by her many other challenging careers. After developing her Toronto-based music career and profile for five years and with contracts in hand, for personal reasons, Elaine was forced to abruptly suspend her musical career. It broke her heart. Currently, Elaine A. Small has just completed her second album titled “All or Nothing at All,” released in November, 2016. This eclectic album again features some of Canada’s top musicians, (including the 2016 Juno Jazz Piano winner, Roby Botos) ; all perform a compelling array of rhythm, reverie and blues—standards of the late ‘60s presented in a fresh way where the melody line, supported by Elaine’s sophisticated, lush, velvet voice, purrs throughout Brian Barlow’s unique and tasteful arrangements with ease—all designed to please any and every, musical pallet …. A Star is reborn! 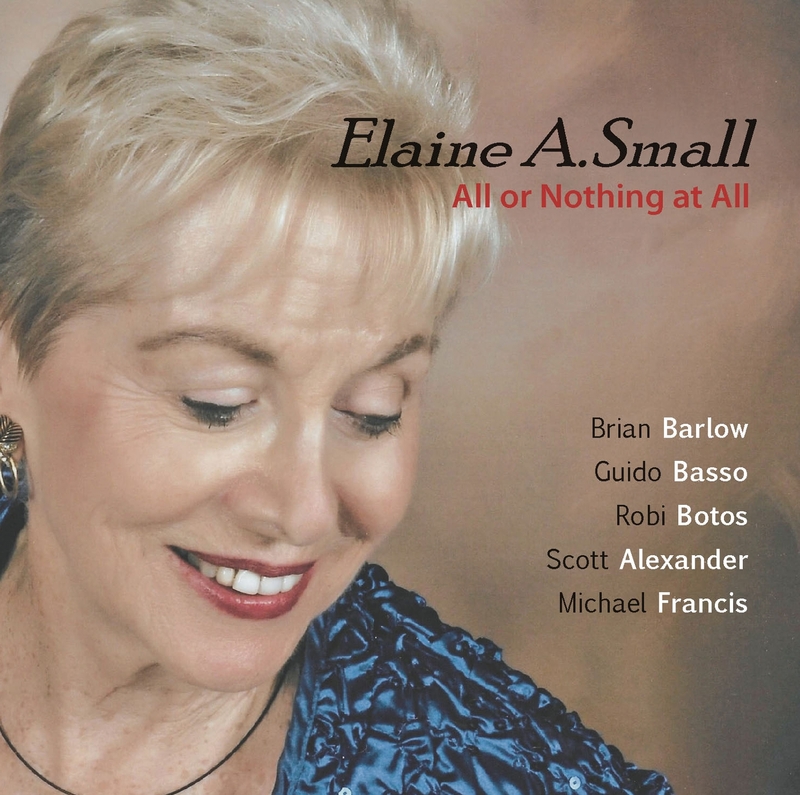 With the release of her second album, after an absence from the music scene of close to five decades, Elaine offers us renditions of well established cover songs with a clarity of lyrics which honor the intent of the original writers of these wonderfull standards. She is supported throughout by what has been described as about the strongest group of award winning musicians which anyone might put together. The result is a throughback to the days when one took the time to relax, listen and enjoy the music offered by these Great American Songbook tunes. This collection is indeed a worthy addition to any music lover's collection..